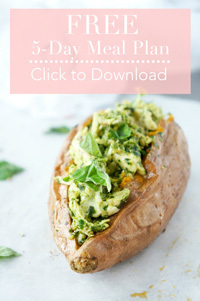 Sweet potatoes are something that our whole family loves, including baby, so I’m always trying to find new and interesting ways to serve them up. As much as we love these recipes, there’s only so many times you can make the same recipes before they start getting a little, well, old. 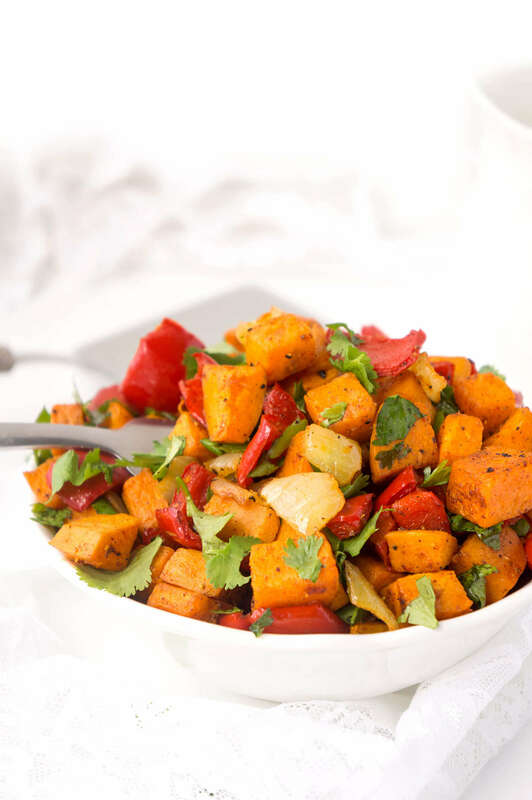 I had some red pepper, sweet potato and cilantro to use up, so I decided to combine it all together to come up with this delicious Sweet Potato Hash. It was so simple, yet SO flavourful. 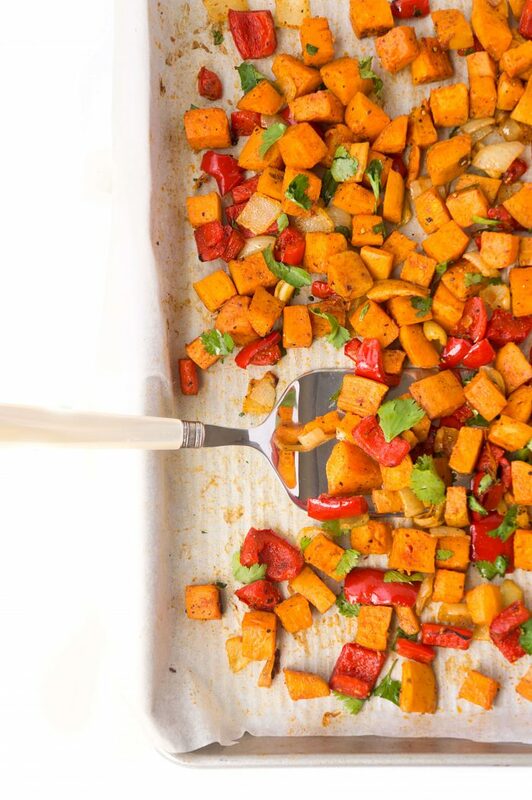 First, you’ll need to cut up the sweet potato, onion, and red pepper into about 1-inch pieces. Try to make them roughly the same size so that they finish cooking at the same time. Next, toss into a medium-sized bowl along with some olive oil, garlic, chili powder, paprika, salt and pepper until well combined. Spread out on a parchment paper lined baking sheet and bake at 400 degrees F for 30 minutes, flipping half way through the cooking time. 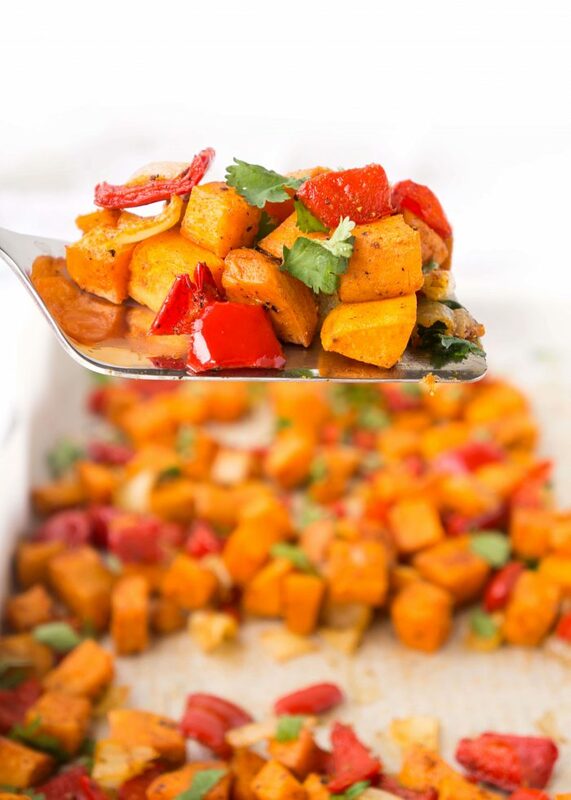 Remove them from the oven once the sweet potatoes and vegetables are soft and serve immediately. So you may be thinking, okay, I’ve got this awesome side dish but what the heck do I serve it with?! I’ve got a few suggestions for ya! The options really are endless! I can’t talk highly enough about sweet potatoes because there are so many nutritional benefits associated with them! An excellent source of vitamin C. One half cup serving offers 21 milligrams of vitamin C, which is almost one-third of a day’s requirement for women and one-quarter of a day’s worth for men. 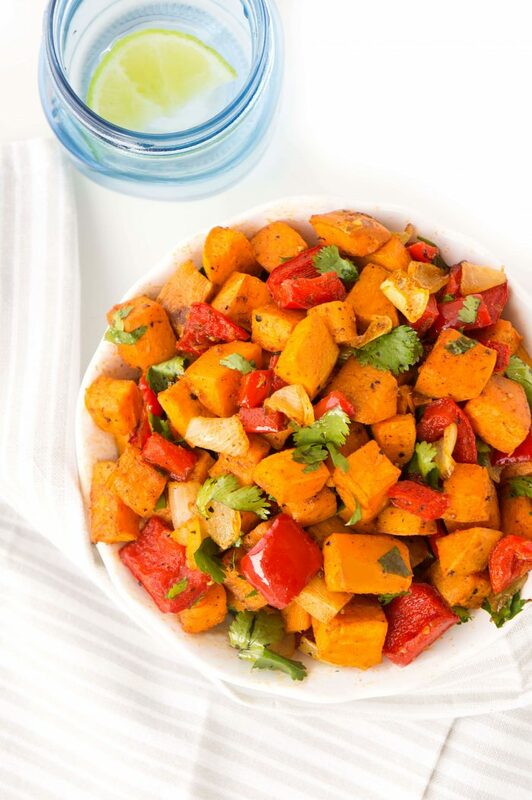 Sweet potatoes are also a good source of niacin and vitamin B6. 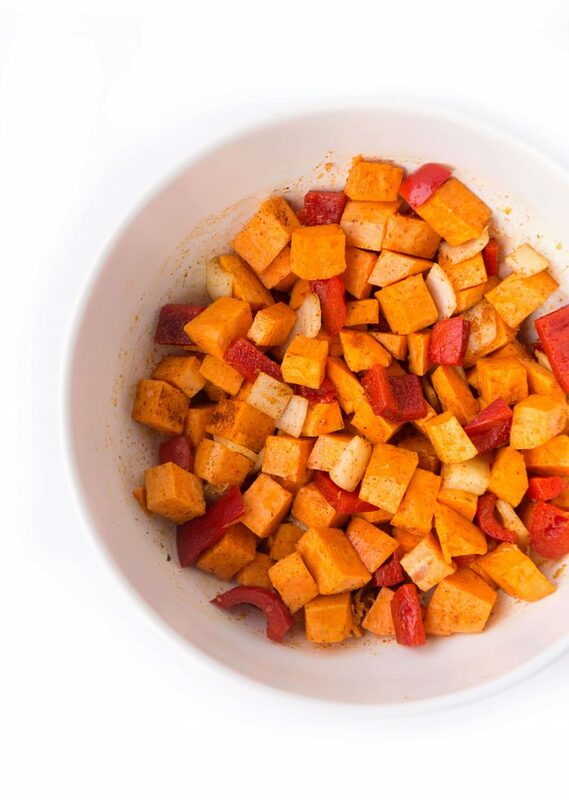 You totally want to go out and get some sweet potatoes now, right?! Line a large baking sheet with parchment paper and set aside. Place sweet potato, onion, red pepper, garlic, olive oil, paprika, chili powder, salt and pepper. Toss until mixture is coated in oil and spices. Place mixture on prepared baking sheet and spread out into a single layer. Bake for 25-30 minutes, flipping half way through cooking time. Sprinkle mixture with fresh cilantro. Serve immediately. 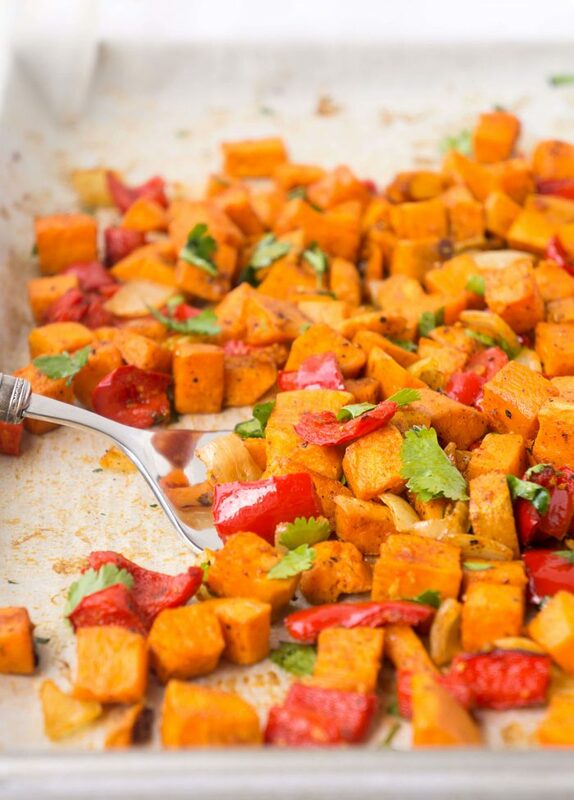 If you have a chance to try out this Sweet Potato Hash, I’d love to see your pics! Tag me on instagram @hauteandhealthyliving and use the hashtag #hauteandhealthy!